The global light engine market is prognosticated to expand at a significant pace within the forecast period from 2018 to 2026, at a steady CAGR of 9.61%. 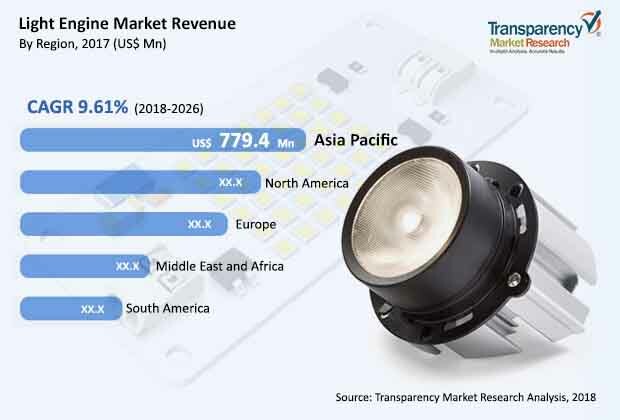 The global light engine market is foreseen to keep on being influenced due to various factors for example, increase in adoption of LED lighting all over the world. Moreover, various government regulations imposed regarding energy saving and adoption of LED is another contributing factor in the growth of global light engine market. Based on application, the residential segment is foreseen to increase the revenue by the end of forecast period, due to rise in urbanization and increase in number of smart cities across the globe. Thus, increased adoption of LED lighting in residential segment is a propelling factor behind the high demands. Besides, various initiatives taken by the government in order to spread awareness about using LED and discarding conventional lamps is one more reason behind the surge in demand for light engine in commercial sector during 2018 to 2026. Moreover, the rise in usage of flexible light engines in commercial and residential area is also leading to the expansion of the market in coming years. Additionally, the extensive usage of round or linear light engine in areas such as industrial, commercial, and residential is also fueling the overall demand in the market. Furthermore, horticulture and automotive industries are using rigid light engines. Also, LEDs are being used in street lights, which is acting beneficial for light engine market, globally. Regionally, North America is anticipated to account for a major market share of the light engine market within the forecast period. This is as a result of the presence of various well-settled organizations in the region. In addition, the region is experiencing increased rate of adoption of light engine due to consistent advancement in technology, along with several initiatives by the governments of several countries. Apart from North America, another key region accounting for substantial share in the market is Asia Pacific. Nations such as Japan, China, and India are foreseen to hold an important place in the market growth. However, the factors supporting the growth in the region is same, such as rise in initiatives by the government, encouraging the population to use LED lightings. According to the Street Light National Program by Indian government, in 2017, around 21 lakh LED lights were installed in India. Such efforts are anticipated to boost the light engine market in the Asia Pacific region. Nevertheless, rise in population in China, coupled with adoption of LEDs,is likely to play a major role in market growth. Some of the key players in the market are OSRAM Licht Group, Philips Lighting Holdings B.V., Fulham Co., Inc., MaxLite, Inc., Tridonic, General Electric Company, Fusion Optix, Inc., Thomas Research Products, Cree Inc., and RS Components Pty Ltd.